We’d love your help. Let us know what’s wrong with this preview of Prometheus Unbound by Percy Bysshe Shelley. One of the most ambitious dramatic poems ever written, Percy Bysshe Shelley's Prometheus Unbound tells the story of the Titan Prometheus who gave mankind the secret of fire in open defiance to the decrees of Zeus, and who, as punishment for this generosity, was chained to the Caucasus Mountains and exposed to horrible tortures. Inspired by the Prometheus Bound of Aeschylus One of the most ambitious dramatic poems ever written, Percy Bysshe Shelley's Prometheus Unbound tells the story of the Titan Prometheus who gave mankind the secret of fire in open defiance to the decrees of Zeus, and who, as punishment for this generosity, was chained to the Caucasus Mountains and exposed to horrible tortures. Inspired by the Prometheus Bound of Aeschylus, Shelley's play serves as a sort of sequel, matching its Greek predecessor in stature and pure poetic power. To ask other readers questions about Prometheus Unbound, please sign up. This is probably what you would consider to be Shelley's Magnus Opus. This would be his most ambitious work and also what he is probably most famous for (though at least one lecturer has suggested that as a poet Shelley is somewhat dwarfed by his wife Mary Shelley, who is also the author of Frankenstein). This is sort of a sequel to the Aeschylan play Prometheus Bound and I say sort of a sequel because we have fragments of the original sequel, but the play itself is lost. 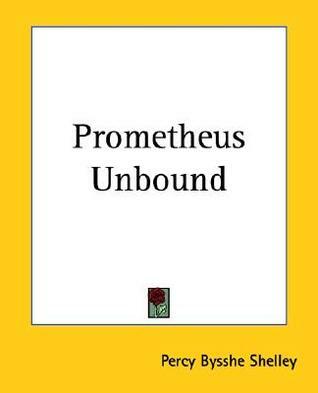 Prometheus Unbound is what you call a lyrical drama, which is in a similar vein to Milton's Samson Agonistes. The idea of a lyrical drama is that it is not written to be performed but rather to be read (and as I have indicated reading a drama without watching it being performed can be a difficult task), the performance, as some have suggested, goes on in the imagination. The scope of this work is immense and Shelley explores some of the themes that have come out of the original play, and then brings them through to his own conclusion. While Shelley was an atheist, he uses the mythological as a method of criticising his own society, and the conflict that had arose between faith and science. Shelley's Jupiter is representative of God, which, to Shelley, is representative of the church who seeks to hold society in chains and prevent them from being able to examine and question the world in which he lives. His Prometheus is representative of the rational human, the one who questions and explores, but is attacked by the church because of that desire. Demogorgon could be seen as social change, which frees the rational mind from those chains, and pushes blind faith into the background. 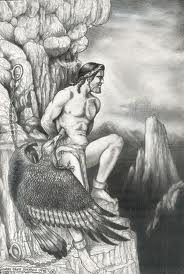 The idea behind the original play is that humanity had fallen from grace and was living in a world of suffering, so Prometheus, against the decree of Zeus, teaches them the art of making fire and for doing so he is punished by being chained to a rock and having his liver ripped out on a daily basis by a vulture. The play ends with Prometheus being cast down into the netherworld. The idea that I see in this play is the concept of humanity being given the gift of technology (which is representative of fire) and by having this ability it strengthens them against the power of the deity. In Shelley's mind this is the idea of science, and we see in the past when people began to explore the nature of the world the church would respond in an aggressive manner, for fear that in doing so God would be unseated from his throne. This war continues to this day, with fundamentalist preachers (and I am only speaking of Christianity here) claiming that science unseated God from his throne, and evolution unseated humanity from the pinnacle of creation. In the end though, no matter how much faith we have, the Earth is not the centre of the universe. Notice though that the original play ends with Prometheus being cast into hell, and that the second play, where Zeus and Promentheus are reconciled, no longer exists. It may be just coincidence, but the play ends with the triumph of faith over reason, and the play in which faith and reason come together in mutual agreement no longer exists. In a way this is very Hegalian in that we have opposites, with the thesis being faith and the anti-thesis being reason (or is it the other way around? ), but the reconciling (or the synthesis) of faith and reason never comes about. Even today many a church baulks at the concept of a synthesis between faith and reason, and forces reason, and with it humanism, out of the door. My position is that since God gave us the gift of reason, the ability to be able to think and question, then to deny that gift, and to deny everything that comes from that gift, is to do a disservice to God. However that does not mean that we do not question what comes out of humanism, for to blindly accept what is said without questioning is to once again do a disservice to God. As for Prometheus Unbound, there is no synthesis of faith and reason. In fact faith comes out as the loser in the struggle, with reason being freed by Demogorgon (and being an atheist we cannot consider that Shelley would necessarily believe in Satan), with represents the complete destruction of faith. In the end reason triumphs, and faith, and the church, are left being in the dark annals of history. Notice though, that it is Demogorgon and not Satan. Shelley is purposeful in this in that he indicates that the character of Satan, as painted by Milton, is a rather poor character in his opinion. Granted, Shelley could have created his own Satan, however he seems to feel bound to Milton's interpretation, and a creature that is fuelled and dominated by revenge would not serve the purposes of his poem. Shelley did not want a character with a chip on his shoulder, but rather a character that frees reason from his chains to allow him to prosper and flourish. "For my part I would rather be damned with Plato and Lord Bacon, than go to Heaven with Paley and Malthus." In Aeschylus’ Prometheus Bound, we see him by the end of the book being buried under the rocks that crumble, midst thunder and lightning. Prometheus, the god,(unjustly) bound to a rock by other gods, had though made a promise: “I swear in that moment there won’t be no fear “. He had a secret; “there will be a day when my value shall be needed.” The god wanted to give the fire to men...and g "For my part I would rather be damned with Plato and Lord Bacon, than go to Heaven with Paley and Malthus." In Aeschylus’ Prometheus Bound, we see him by the end of the book being buried under the rocks that crumble, midst thunder and lightning. Prometheus, the god,(unjustly) bound to a rock by other gods, had though made a promise: “I swear in that moment there won’t be no fear “. He had a secret; “there will be a day when my value shall be needed.” The god wanted to give the fire to men...and got punished. Shelley, maybe inspired by the “bright blue sky” of Rome decides to resurrect Prometheus; now he’ll be unbound. …released by Hercules. The book starts with him bound to a precipice, morning breaking…Panthea and Ione meeting Prometheus. The voices of the air, the springs and mountains, the whirlwinds…and Earth itself, have kept silent for many years (3,000 years of sleep)….for fear of the Monarch of the Gods and the daemons. Now, pierced and mocked Prometheus has no more hate, though. I finally decided to read this. I think this is truly fantastic. Very inspired by John Milton's Paradise Lost - my favorite all time book; the verse is soaring and heightened in its blank verse, which has an authentic difficulty amid its grandiloquent flights of poetry. The characterization is quite interesting. Prometheus, Hercules, quite interesting. I also am struck by the "fall of Jove" echo, and the recurrent optimism of a better hope amid the painful sufferings of Prometheus. In many ways, I finally decided to read this. I think this is truly fantastic. Very inspired by John Milton's Paradise Lost - my favorite all time book; the verse is soaring and heightened in its blank verse, which has an authentic difficulty amid its grandiloquent flights of poetry. In many ways, Shelley writes a very classical work with a Romantic flavor, with its own experimentalism - especially in Act IV, where the verse varies in meter and form, though all in the elevated register. I am a huge fan of mythology, particularly Classical mythology. While Shelley is undoubtedly a talented poet, I found his interpretation of the Roman pantheon to be off somehow. I wasn't convinced that the Jupiter and Mercury I was reading about were the deities that I had read about since childhood. The characters were all rather flat, as well, being designated as either wholly good or wholly evil. Now I know Shelley was a Romantic poet, but I really cannot emphasize enough how flowery and unnec I am a huge fan of mythology, particularly Classical mythology. While Shelley is undoubtedly a talented poet, I found his interpretation of the Roman pantheon to be off somehow. I wasn't convinced that the Jupiter and Mercury I was reading about were the deities that I had read about since childhood. The characters were all rather flat, as well, being designated as either wholly good or wholly evil. I will definitely try and reread soon, for doubtless, this book is one I should love. Pure love! Another star added. 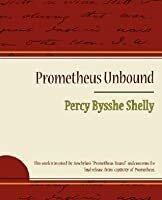 So there are a lot of ways to look at Shelley's Prometheus Unbound: as a continuation of Aeschylus's Prometheus Bound, as its own closet drama, or as a framework for Shelley to write poetry on nature and classical mythology. Unfortunately, in my opinion Prometheus Unbound fails no matter which of the three ways you look at it, and I'm actually left scratching my head at how badly Shelley messed up considering that he was handed such an interesting subject on a silver platter. Aeschylus's Promethe So there are a lot of ways to look at Shelley's Prometheus Unbound: as a continuation of Aeschylus's Prometheus Bound, as its own closet drama, or as a framework for Shelley to write poetry on nature and classical mythology. Unfortunately, in my opinion Prometheus Unbound fails no matter which of the three ways you look at it, and I'm actually left scratching my head at how badly Shelley messed up considering that he was handed such an interesting subject on a silver platter. Aeschylus's Prometheus Bound is a work with amazing potential, the only surviving play in a trilogy that functions as a fascinating introduction to the Prometheus myth. Both Prometheus and Zeus are established as characters with depth, and their conflict is both nuanced and dramatic. It's impossible to say whether the potential of Prometheus Bound was fulfilled by Aeschylus's later plays, but I know for certain that said potential wasn't realized by Shelley. 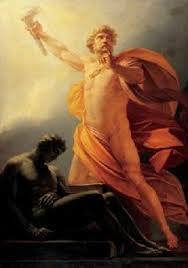 Instead of the fully developed characters of Prometheus Bound Shelley takes Prometheus and makes him a one-dimensional martyr, reassigning the pride that was evident in the Aeschylus version of Prometheus to Zeus. Shelley's Prometheus has no flaws of any consequence, instead he's just a name that undergoes unjust suffering and whose eventual release heralds a new age of peace and prosperity. He's the prophesied chosen one, a role which apparently Shelley doesn't think requires any further characterization. Zeus is also far less interesting here than in Prometheus Bound, as Shelley has made Zeus into a pure tyrant, with no reference to his recent rise to power and subsequent shift in behavior that made him an interesting character when crafted by Aeschylus, despite the fact that Zeus never appeared onstage in Prometheus Bound. Even minor characters like Mercury are made less compelling by Shelley than the ancient source material he had to draw inspiration from. While Prometheus Bound was the beginning of what promised to be a play of both emotional and potentially moral complexity, Shelley's play is one of black-and-white morality and one-dimensional characters. Compared to Prometheus Bound, Prometheus Unbound is banal and unimpressive. Looking at Prometheus Unbound independent of Prometheus Unbound it still fails to excite. Shelley wrote this as a closet drama, meaning it was not intended to actually be performed, and I have to say that's an excellent decision because I can't imagine any way to stage and perform this play that wouldn't be mind-numbingly boring. All the flat characters only communicate through page long speeches, the actual action of the play occurs solely in the first act and the first few pages of the third, and the fourth act is so superfluous that Shelley didn't even originally include it as part of the play but instead tacked it on later. The ancient tragedians knew how to get to the point, and even more contemporary playwrights to Shelley like Shakespeare knew the art of merging their exquisite language with dramatic and compelling plots. There is no evidence in Prometheus Unbound that Shelley possessed that ability, and the story of Prometheus isn't one that precludes dramatic tension by any means. Shelley's four act play rambles on, brushing the key events out of the way as quickly as possible so as to fit in more passages of Earth and Asia and the Moon and other "characters" either despairing over the fate of Prometheus and the current state of the world, or in the second half of the play praising the changes that have occurred and the new state of things. Jupiter (Zeus) literally appears for all of three pages. The Moon gets more lines than Jupiter does. In sum Prometheus Unbound, even if you aren't comparing it to other plays, is a poorly structured work that fails to be at all compelling, instead continually going off on tangents and focusing on minor occurrences while giving very little attention to major ones. These failings are why I believe Prometheus Unbound should really be considered a framework for Shelley's poetry instead of as a drama of any sort, closet or otherwise. Seriously, even if Shelley was a complete fool he probably could have written a play with better structure than this if crafting an interesting play was his goal. Instead, if his intention was to use the classical framework established by Aeschylus as a jumping off point for his poetry, then the structure of the play and the characters he chose to focus on makes far more sense. Unfortunately, while more understandable, Prometheus Unbound isn't very good when considered as a poetry framework either. Shelley can write great poetry, no question, the go-to example that almost everyone is familiar with being Ozymandias, and other efforts by Shelley (some included with Prometheus Unbound when it was first published) are also impressive. In Prometheus Unbound there is little of Shelley's best on display when it comes to poetry. For every character's speech that works well as a poem there are a dozen that seem mediocre poetry at best- and I'm probably being generous, as most lines don't even seem to meet the threshold of poetry but merely read as prolix prose. Additionally, reading over a hundred pages of Shelley's second tier poems stapled together isn't the format to appreciate his poetic talents. Especially when the fourth act rolls around and the story has already been completely resolved, the poetic dialogue of the various characters is distinctly underwhelming, more tedious than anything else. There is good Shelley poetry out there, but Prometheus Unbound does not showcase his best work, largely giving us overwritten and unimpressive speeches instead . نخستین نکته ای که باید متذکر شد این است که عدم رضایت من از این اثر تقریبا به طور کامل به ترجمه ی آن مربوط است - اصل اثر شایسته ی سه ستاره یا حتی بیشتر است. ترجمه مطلقا قابل خواندن نیست. به این معنا که بدون مراجعه به متن اصلی ساختار جملات قابل تشخیص نیستند - به دلیل عدم رعایت نقطه گذاری و ... از یک سو و عدم استفاده از "را" و ... که نقش مفعولی و ... را بیان می کنند. مترجم هر خط شعر را گویی مستقل از قبل و بعد آن ترجمه کرده است. Tho نخستین نکته ای که باید متذکر شد این است که عدم رضایت من از این اثر تقریبا به طور کامل به ترجمه ی آن مربوط است - اصل اثر شایسته ی سه ستاره یا حتی بیشتر است. ترجمه مطلقا قابل خواندن نیست. به این معنا که بدون مراجعه به متن اصلی ساختار جملات قابل تشخیص نیستند - به دلیل عدم رعایت نقطه گذاری و ... از یک سو و عدم استفاده از "را" و ... که نقش مفعولی و ... را بیان می کنند. مترجم هر خط شعر را گویی مستقل از قبل و بعد آن ترجمه کرده است. مترجم بخش اول را به چیزی شبیه این ترجمه کرده است: " تو رقت بارترین ایشانی! " حال آنکه واژه ی دوم نه صفت بلکه فعل است و آن هم به صرف رایج در انگلیسی قدیمی - و ادبی - برای ضمیر کهن تو - اولین کلمه. مثل ضمیر دوم شخص مفرد در آلمانی که در پایان اس و تی می گیرد. پس ترجمه در واقع اینگونه است: " تو بر ایشان دل می سوزانی؟! " البته در جاهای دیگری مترجم این صرف را درست ترجمه کرده است، پس یا باید این غلط را از گیجی مترجم یا گیجی ویراستار دانست. و مترجم ترجمه کرده است: " سپاس! سپاس! " حال آنکه معنای آن این است " رحم کن! رحم کن! " ! خلاصه آنکه اگر کسی بخواهد این ترجمه را در دست بگیرد بدون شک باید اصل اثر را در پیش خود داشته باشد و بیشتر برای اینکه معنای کلمات ناشناخته را بداند به ترجمه مراجعه کند. اما خود اثر هم خالی از دشواری نیست. انبوه استعارات و تشبیه ها اثر را غرق ابهام کرده است. چنانکه می توان گفت اثر اصولا داستانی ندارد. صرفا مکالماتی است سرتاسر تشبیه برای بیان احساس و ... . مثلا آنجا که دموگورگون - خدای نگهبان دوزخ - نزد ژوپیتر می رود تا آن را از جباریت خود به زیر بکشد و به جهان زیرین ببرد، داستان صرفا با گفتن دموگورگون و چند جمله مقاومت ژوپیتر پایان می پذیرد و خواننده که منتظر جدالی طولانی است معطل می ماند! در چند خط کار ژوپیتر تمام می شود! باید اذعان کنم که در این اثر انبوهی از وجه شبه ها و چه بسا مشبه و مشبه به ها را متوجه نشدم!! اما بخش هایی هست از این اثر که شاهکار بودن آن را برملا می سازد. اصولا این اثر اثری است برای بازگشت دوباره و دوباره و خواندن بخش های آن و نه اثری که باید از سر تا ته خواند. Shelly continued Aeschylus’s story and transformed it into a symbolic drama about the origin of evil and its elimination. He wrote in his preface that Prometheus is, ‘’as it were, the type of the highest perfection of moral and intellectual nature.’’ But he also warned that it is a mistake to suppose that the poem contains ‘a reasoned system on the theory of human life. Prometheus unbound is not a dramatized philosophical essay, nor a normal allegory, but a large and very intricate imaginative construction which involves premises about the nature of man and the springs of morality and creativity. It represented the view that both the origin of evil and the possibility of reform are the moral responsibility of man himself, just as social chaos and wars are gigantic projection of man’s moral disorder and inner division and conflict. To end up, with the Triumph of Life and some of the longer lyrics, Prometheus Unbound constitutes a weighty claim to rank Shelly as among the major poets. What a strange play! Totally very Romantic - loaaads of lush nature imagery which paints pretty pictures in my head! And I love the idea that 'love' and equality can unlock the secrets of the universe and cause a wide-spread party, at the end of this even the moon is celebrating! Shelley is a lexical, storytelling boss! Move over Byron, you've been whupped! The nature imagery is powerful and animates each aspect of nature. It reminds me of Homer's Ancient animist themes from The Iliad but has what I'm guessing is the updated Romantic, idealist themes slant added. Naturally, I've got to read the original, Aeschylus' Prometheus Bound next. By far one of the most original, lofty poetic works I have read in a really long time. I wasn't a Shelley fan ever, I don't think I am a fan of his even now, but I certainly found this book Sublime in all senses of the word. I like how he has morphed the myth that was penned into a play by Aeschylus and given it an alternate ending, more daring and emboldened by tempering it with quintessential Romantic sentiment. The poem is darkly poetic, grandiose and prophetic. This is perhaps the only work o By far one of the most original, lofty poetic works I have read in a really long time. I wasn't a Shelley fan ever, I don't think I am a fan of his even now, but I certainly found this book Sublime in all senses of the word. Hmm. I think that maybe my expectations were a tad too high for Prometheus Unbound. On one hand, it is an interesting follow-up to Aeschylus' Prometheus Bound, but it is actually inferior to the earlier work. I know that Shelley was going for being Romantic but also taking from the style of the Greek dramatists, but I don't think that it worked for me. I usually would praise Shelley's beautiful use of the English language, but in the case of a dramatic work, I think that flowery verse obscures t Hmm. I think that maybe my expectations were a tad too high for Prometheus Unbound. On one hand, it is an interesting follow-up to Aeschylus' Prometheus Bound, but it is actually inferior to the earlier work. I know that Shelley was going for being Romantic but also taking from the style of the Greek dramatists, but I don't think that it worked for me. I usually would praise Shelley's beautiful use of the English language, but in the case of a dramatic work, I think that flowery verse obscures the story, making it hard to understand for anything but its pretty outer shell of description. Additionally, Shelley has a way of being super philosophical and super metaphorical about everything; while that works okay for his poems, I feel like that can only hurt a drama. Sure, a small dose may be okay. But anyone who has read any Shelley knows that he lays it on thick- there's no such thing as "a little bit" of philosophy for him. Therefore, this play comes off as clunky, pseudo-Greek, and difficult to follow. Oh the romanticism. Oh the purple prose. Oh the WTF are the characters chirping about over and over. Já ty romantiky prostě nemusím. Overflow of powerful feelings budiž, ale na tolik stránek v kuse? notes from Mary in John Keats and Percy Bysshe Shelley: Complete Poetical Works, Modern Library: New York, 1932. "He followed certain classical authorities in figuring Saturn as the good principle, Jupiter the usurping evil one, and Prometheus as the regenerator, who, unable to bring mankind back to primitive innocence, used knowledge as a weapon to defeat evil, by leading makind, beyond the state wherein they are sinless through ignorance, to that in which they are virtuous through wisdom." (295 notes from Mary in John Keats and Percy Bysshe Shelley: Complete Poetical Works, Modern Library: New York, 1932. I don't have a formal review in my head for this one. I read it today in a waiting room while my son was knocked out having oral surgery, so I was, perhaps, a bit distracted. The language was exquisite, if a bit florid at times, but this quibble can surely be pinned on the age of the piece. There were many flashes of imagery that jumped off the page, but the plot often meandered. Overall, there were parts I simply loved and parts I found my eyes trying to gloss over sleepily. I would recommend t I don't have a formal review in my head for this one. I read it today in a waiting room while my son was knocked out having oral surgery, so I was, perhaps, a bit distracted. So disappointed, for many reasons I thought it would be wonderful to read. I even prepared for this by reading 'Prometheus Bound' from Aeschylus not two weeks ago. First thing that bothered me was the Latin names for everyone, sure they were the norm then but Shelley was influenced directly by the Greek play, why not use the Greek names? Then it was his style: aesthetically pleasing or not it was difficult to read, which made it difficult to like and that, in turn, made it a chore to finish. Las So disappointed, for many reasons I thought it would be wonderful to read. I even prepared for this by reading 'Prometheus Bound' from Aeschylus not two weeks ago. First thing that bothered me was the Latin names for everyone, sure they were the norm then but Shelley was influenced directly by the Greek play, why not use the Greek names? Then it was his style: aesthetically pleasing or not it was difficult to read, which made it difficult to like and that, in turn, made it a chore to finish. Lastly, the outcome was cut short: I would have loved to see a fallen Jupiter (Zeus!) confront Prometheus and have it last a few pages, Shelley could have been very creative here but chose otherwise. Even the end's famed beauty left me wanting. Interesting aside: a lot of the themes in this poem have a vaguely Communist-ish feel to them; a feel as though Shelley would have been a supporter of the Russian revolution (I mean, right up until everything went sideways, obviously). I wonder i Wow. From a customer review on amazon.com: "Prometheus Unbound to be read along with Fredrick Schiller's "On the Aesthetic Education of Man," as a pair, a complement of two books. As you read, and approach the last part the book, suddenly you connect with the feeling of Schiller's poetry at the end of the Ninth Symphony (the chorous) and you are transported beyond the canopy of the stars...!" I read this for my coursework about the Role of the Writer in the Romantic period of Literature. The play was pretty confused and I had to read a summary alongside it! Don't have too much to say about this as I read in light of my essay topic and was mostly annotating key quotes and themes rather than reading it for the plot itself! It was okay, glad that it's finished now anyway! I just cannot bring myself to enjoy Shelley and it has nothing to do with the themes he has chosen here to attempt his art of poesy. I'd rather read Keats' Hyperion poems repeatedly than a single read of this work. epic poems are always an impressive undertaking, but I didn't enjoy it nearly as much as the base myth. I did not enjoy any aspect of this. Completely uninteresting to me in terms of its philosophy, ideas and politics, very poor in terms of characterisation (all of the characters and, by extension, the ideas they represent come across as one-dimensionally good or bad), and not very convincing in terms of the way it used mythology. There was some beautiful imagery, but I was not able to find a single beautiful line, and even that imagery was bogged down in a lot of completely unnecessary and uninsp I did not enjoy any aspect of this. Completely uninteresting to me in terms of its philosophy, ideas and politics, very poor in terms of characterisation (all of the characters and, by extension, the ideas they represent come across as one-dimensionally good or bad), and not very convincing in terms of the way it used mythology. There was some beautiful imagery, but I was not able to find a single beautiful line, and even that imagery was bogged down in a lot of completely unnecessary and uninspired writing. The writing style itself was probably the worst culprit for me. I get it when a poet goes for complicated language to get a specific feeling/rhyme/rhythm/etc. across, but this was complicated in a way that didn't accomplish any of those things. I really had to force myself to read this; I found it extremely tedious. Far from being the story of Prometheus and a celebration of his rebellion against Jupiter (why not Zeus? ), what passes for a plot focuses relentlessly on minor characters who are enraptured in Romantic visions of the passing scenery. My basic objection to this premise is that it was neither as thrilling to read as the epic tale of Milton by which it purports to be inspired, nor as rapturous as Byron's or Clare's writing abo I really had to force myself to read this; I found it extremely tedious. Far from being the story of Prometheus and a celebration of his rebellion against Jupiter (why not Zeus? ), what passes for a plot focuses relentlessly on minor characters who are enraptured in Romantic visions of the passing scenery. My basic objection to this premise is that it was neither as thrilling to read as the epic tale of Milton by which it purports to be inspired, nor as rapturous as Byron's or Clare's writing about the natural world. Shelleytől olvastam pár verset és azok tetszettek (eszesek voltak), de a Prométeusz nem jött be. Az eredeti szöveget is megnéztem, hátha WS fordításával van gondom, de PBS archaizál, amit mai ember már nem olvas – ezeket a műveket sorról sorra érdemes venni, elgondolkodni, elemezni, magyarázni, utánanézni, de együltő helyben olvasásra sajnos már nem alkalmasak. Túl szóvirágos volt ez a költemény, nehezen jött át a mondanivaló. (Az angol Delphi kiadás elején van egy jó kis elemzés, azt érdemes ról Shelleytől olvastam pár verset és azok tetszettek (eszesek voltak), de a Prométeusz nem jött be. Az eredeti szöveget is megnéztem, hátha WS fordításával van gondom, de PBS archaizál, amit mai ember már nem olvas – ezeket a műveket sorról sorra érdemes venni, elgondolkodni, elemezni, magyarázni, utánanézni, de együltő helyben olvasásra sajnos már nem alkalmasak. Túl szóvirágos volt ez a költemény, nehezen jött át a mondanivaló. Percy Bysshe Shelley was one of the major English Romantic poets and is widely considered to be among the finest lyric poets of the English language. He is perhaps most famous for such anthology pieces as Ozymandias, Ode to the West Wind, To a Skylark, and The Masque of Anarchy. However, his major works were long visionary poems including Alastor, Adonais, The Revolt of Islam, Prometheus Unbound a Percy Bysshe Shelley was one of the major English Romantic poets and is widely considered to be among the finest lyric poets of the English language. He is perhaps most famous for such anthology pieces as Ozymandias, Ode to the West Wind, To a Skylark, and The Masque of Anarchy. However, his major works were long visionary poems including Alastor, Adonais, The Revolt of Islam, Prometheus Unbound and the unfinished The Triumph of Life. Shelley's unconventional life and uncompromising idealism, combined with his strong skeptical voice, made him a authoritative and much denigrated figure during his life. He became the idol of the next two or three generations of poets, including the major Victorian and Pre-Raphaelite poets Robert Browning, Alfred, Lord Tennyson, Dante Gabriel Rossetti, Algernon Charles Swinburne, as well as William Butler Yeats and poets in other languages such as Jibanananda Das and Subramanya Bharathy. He was also admired by Karl Marx, Henry Stephens Salt, and Bertrand Russell. Famous for his association with his contemporaries John Keats and Lord Byron, he was also married to novelist Mary Shelley.